But once more I was too optimistic. Instead, I was shoved into the Dark Purse, endured another long shaky subway ride and found myself at a strange place crammed with crazy people rushing around, called "IKEA". It was BIG. Really BIG. 'Specially for a small cat like moi. First things first: Get a shopping bag. But make sure it's a BIG bag. Oh good, here they are! 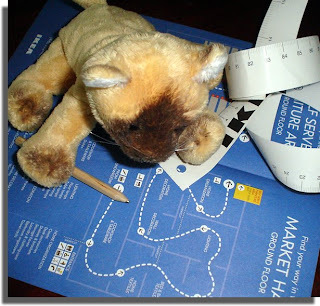 Next, pick up a map. Yep. This place is so BIG you need a map to find your way out, er, around. ... for calculating the amount of days your expedition will require navigating to freedom. Good thing there's a restuarant; we won't starve at least. Oooh! But look what I found! The paper napkins you wanted! And teenie tiny bowls, just MY size! Hooray! We found the exit! You sure you got everything you wanted? Whaddya mean, we're going to Eaton Centre for MORE shopping??? "Don't you have an Ikea in Winterpeg ?" 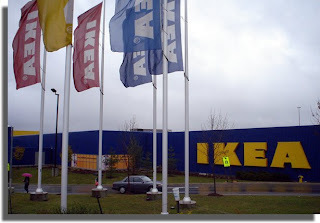 But then I decided to Google "Winnipeg Ikea" and there to my horror sits a "Bring Ikea To Winnipeg Petition" ! Folks ! Go there and sign the Petition and help Sam enjoy the goodness of flat-packaging and self-assembly ! Gawd ! Even a "Burlington" has their own Ikea and it's a lot smaller than Winnipeg ! "He's a jolly fat man, he comes from up north, on a sleigh..."
"Are you SURE you are not talking about my uncle Bob from Thunder Bay !" Lol, Sam sounds like my boyfriend when I want to go to Ikea. 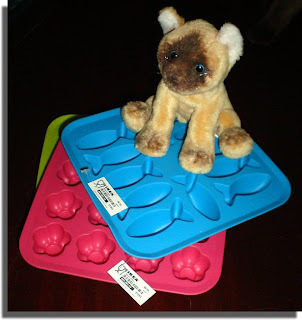 I guess excitement over cheap, colourful, novelty ice-cube trays is genetic! 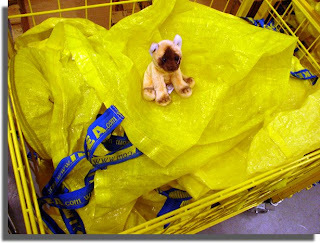 Nice blog and I like Ikea! I LOVE Ikea!!! Love the pics of Sam there too. Very cute! I love Sam!!! Would you believe I've never set foot in an IKEA before? Thanks for the virtual tour. If I ever go, I'll wear good walking shoes. Yikes. How long were you in TO? I'm close, and yes, I within 20 minutes of two, count them 2, Ikeas. I like to go during the week for their Swedish meatball lunch. Oh, the merch isn't too bad either. If you go on weekends it's like there are several family reunions taking a tour of the place. Seriously, grandparents, parents, kids, cousins .... DO NOT DO IKEA ON WEEKENDS!! Jaffer: Sadly, no, no IKEA here... apparently you have to have a population of 1 million before they'll even consider building. Our nearest one is in Minneapolis... Thanks for posting that petition though! I guess I'd better go SIGN it! Ashley: Genetic is right; you-know-who even has her own set! Aw, thanks Heather! 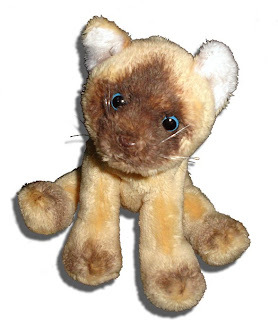 That place was so crazy, no one even batted an eye at a "cat" amongst the crap, er stuff. Kathy: I had never been in one until this summer either... when we went to Minneapolis. Yes, wear good shoes, and it's probably a good idea to pack a snack and some water too... you just may need it. I think they could do an Amazing Race inside one of those suckers. Come to think of it, I think they DID do a desk assembly challenge at the original IKEA in Sweden on one season of TAR. I'm surprised they didn't lose a team inside the store itself. KarenMeg: Two within 20 minutes??? Okay I am jealous... and yes, you are so right about the weekend crowds. Guess which day I chose to go? Yup. SATURDAY! The people were freakin' nuts!!!!! Colleen: I had even made a list. Although I couldn't get a few things due to space constraints; I didn't think WestJet would allow me to bring a huge metal mixing bowl onboard.... darnit. Oh, yes yes yes! Amazing Race did have a challenge in an IKEA. The teams got to choose between putting together a desk or counting out a certain number of frying pans, right? Both turned out to be brutal for the teams, as I recall. Oh, yeah. I'd get lost in the store before I even start the challenge. What made me think I could try out for the race?! OMG - I'm missing all the fun online! Okay, I have to go back and read some previous posts, obviously I've missed a lot! Ikea confuses me, I only go if my niece takes me by the hand. I can sympathize with you. 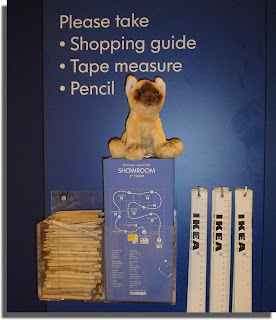 We have bought many things from IKEA. Even when my daughter went to graduate school in Washington DC, we flew back and bought all of her apartment things at IKEA. Like you say, it's a big place. You can easily become lost if you don't pay attention to the signs they hang around the place to orient you. My wife loves to go there periodically just to shop. Admittedly, I'm not so keen on doing things like that, but I take her anyway. 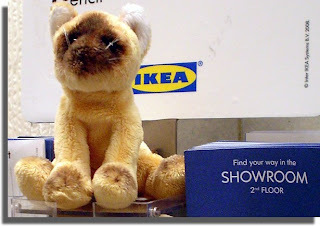 IKEA sort of made me realize that the days of K-Mart and Sears are numbered. The Danish figured out a better way, better designs, better distribution, cheapers prices, and put them all in a store that is a maze, so you have to buy something to find your way out. Ow, and put a restaurant near the exit with really good food, because you will be famished by the time you make it out. American Big Box stored don't stand a chance against this kind of thinking. Pool little guy... I know exactly how he feels. I live within 10 minutes of one IKEA - I get to go often just for their great coffee and have now mastered my way around in a flash - though NEVER on a weekend. But I remember the days of feeling as small and helpless as Sam. 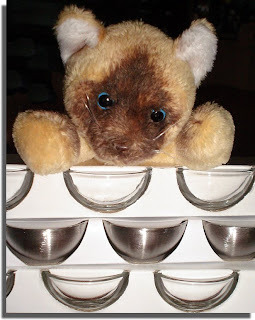 The fish-shaped icecube trays were the BEST! Babs: I could smell that cafe through the whole store... and of course they place it at the end of the trail... I guess if you lost your map, you could "follow your nose" as Toucan Sam would say. Kathy: I still think you and Ann would have been fantastic... they don't know what they missed by not choosing you two. Thanks for the link too - I finally signed it! Drowsey: I thought of you while Sam and I toured around TO! I am sure we got less weird looks than you and Olga would have. Bruce: You are probably right. K-Mart up here went under years ago. 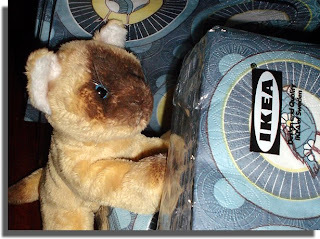 I am sure IKEA will be around for a long time. Jeff: Ha! Too bad I hadn't met Sam in the summer eh? Technodoll: My daughter agrees with you wholeheartedly! Her favorite tray, I think. We have hearts, puzzle pieces, bars, flowers, swirls and fishes. They are very fun! I am fond of such big shops like Ikea. There is lots of necessary goods. One day isn't enought to look through everything. It's really cool & funny what you have done with the pics. 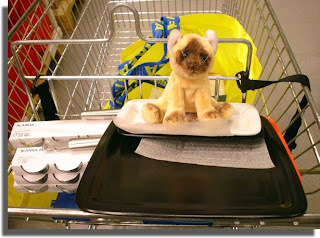 IKEA is a great store, and thos pictures are adorable!